The Tour De France is the world’s largest annual sporting event. The entire race covers approximately 3,500 kms. 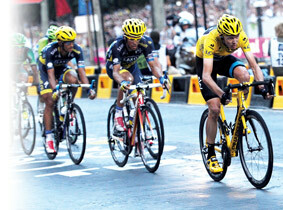 A worldwide television audience of 3.5 billion people watch the Tour De France annually. 1,200 hotel rooms are reserved each night for the teams, staff,press and tour personnel. The Tour De France attracts 12 million spectators along the route in a typical year’s race. The last time the Tour visited England was in 2007 when it raced from London to Kent, 2 million people turned out over 2 days and it’s estimated it brought £88m to the south-east economy. The commercial impact of sports tourism. A glorious summer last year combined with a recovering economy means tourism is currently one of our fastest growing sectors and there is no denying that when the weather is good, the UK and its great outdoors is a wonderful place to be. This will be boosted further this summer with a calendar of top sporting events, including the Commonwealth Games, Ryder Cup and the opening stages of the Tour De France, the world’s biggest spectator event. Le Grand Départ begins in Yorkshire on the 5th July and for businesses throughout Yorkshire, Cambridgeshire, Essex and Greater London is expected to bring in over £100 million in visitor spend. Plus, the impact of the World Cup should not be underestimated, with pubs, off-licences and supermarkets set to benefit from a boost in consumer spending alongside an anticipated increase in advertising spend from businesses. There are numerous public screenings planned in locations such as arenas and town squares and many businesses are capitalising on the excitement by holding events such as BBQs, world cup parties and even corporate events. With London cited as the number one tourist city in the world, the UK as a whole now sits in eighth place in a global league table of visitor numbers and these events could mean we climb even higher helping to persuade plenty of people to enjoy a ‘staycation. An already popular phenomenon due to poor exchange rates and rising airfares. Last year the Association of Leading Visitor Attractions, whose members include palaces, castles, cathedrals, zoos, historic houses, heritage sites, gardens and leisure attractions, revealed outdoor attractions saw visitor numbers grow by 8% on average over the previous year. You can be sure they will want to continue building on that success this summer. But it’s not just tourist attractions that can take advantage of the summer programme. Such events are often the ideal opportunity to get staff together out of working hours and improve morale with a company party, BBQ or teambuilding event. So, make sure your business benefits this summer!